“We have had 729 injured, 700 of them have been treated and released … some 18 people have been hospitalised,” the provincial governor, Houshang Bazvand, told state TV on Monday. 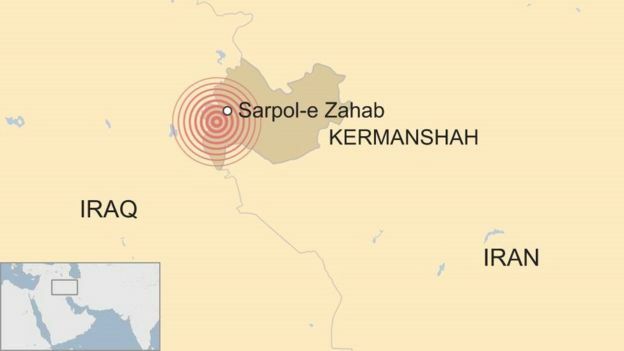 An official for Iran’s Red Crescent Society, Morteza Salimi, told AFP that most of Sunday’s casualties were caused by a stampede sparked by the first tremors. State TV aired footage of damaged houses in Sarpol-e Zahab, where a number of people still remain homeless after last year’s destructive earthquake. Dozens of rescue teams, as well as the national army and Iran’s Revolutionary Guards have been deployed, the authorities said. President Hassan Rouhani “has ordered officials to do whatever is necessary to provide help for the victims,” state TV reported. According to officials in nearby Iraqi Kurdistan, one person died and 43 others were injured in the quake. Residents in the Iraqi capital Baghdad – about 175km away – and several other Iraqi provinces also felt Sunday’s quake. Many people in the affected areas in Iran were forced to spend the night outdoors in cold weather due to concerns about aftershocks. Iran sits on two major tectonic plates and is prone to frequent seismic activity. In 2003, a 6.6-magnitude earthquake destroyed the historic city of Bam in the south-east of the country, killing 26,000 people. THE END OF ALL THINGS IS NEAR (1 Peter 4:7)!!! REPENT FROM YOUR SIN!!! GET READY FOR CHRIST’S RETURN.